Wed: A 20-30 minute TT in zones 4 or 5 with a slightly bigger gear than normal. Thur: Ride in 1-2 zone, mostly 1 zone. Flat course. Low effort--light on pedals. Fri: Hilly ride long and short hills. Attack short hills. Strong on long hills but no popping. Normally, Saturday and Sunday are long rides, however my duties as a California Teachers Association State Delegate will prevent me from riding this weekend. On weekends when I have CTA State Council or other conferences, I try to do at least a short ride on a hotel lifecycle. I’ve had a couple of days at home to relax and recover from the Solvang ride, which by the way, was a lot of fun. Not only was it fun riding, but it was fun sharing the ride through blog posts, facebook and twitter. You can see a few pictures from the weekend in Solvang on the sidebar. 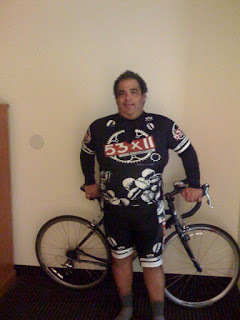 I look forward to continue sharing not only rides but my progress in terms of training and weight loss. Solvang was a really nice example of how focused training can improve performance. In the weeks since the Tour de Palm Springs, I decided that I needed to work on a) Climbing hills and b) Spinning. In a way the first goal is easy because the only way to get better at climbing hills is by climbing a lot of hills. But the spinning part, that one requires patience. Most of us want to get on a bike and turn a big gear and “feel the burn” and go fast that way. But for extended efforts I’ve come to believe that it’s better to perhaps turn a smaller gear, but do so at a faster cadence. It fatigues the muscles less and getting good at it means you don’t loose speed, and in fact, you can gain some. Although I'm still working on these skills, things wen't well last weekend. The first 23 miles were pretty fast. I attacked on short hills and was patient on longer/steeper hills. The last couple of miles before the SAG station around mile 23 there was a lot of headwind. The loop around the city of Lompoc was slower, in part because of traffic and lights. Once we got back on highway 246 things got a bit challenging. Most of that ride are long climbs, nothing too high or too steep, but climbing nonetheless. Although the downhills are nice and long as well, I had to fight getting too discouraged. There were some section where I was going much slower than I wanted to. On the last climb into Solvang I caught up with Molly, (she skipped the Lompoc Loop), and we headed into the finish line together. It was a lot of fun. Up next... Rosarito-Ensenada Fun Ride. My final time plus 10 minutes at the rest stop. 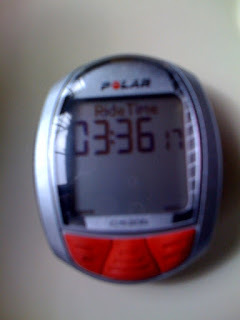 A personal record for a fifty mile ride. Thanks for checking in! So long from Solvang! If you are ever in Solvang, I highly recommend the Lucas & Lewellen tasting room. Great wines, fun people. Now that lunch is done, let the wine tasting begin! Molly says she wants to curl up in the back seat of the car and cry like a girl! Had some block shots. Caught up with Molly...waiting for for her to get back from a nature break. 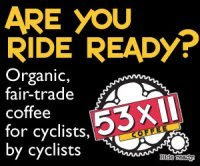 Evan at the 53x11 booth had a steaming cup of java for me. 5 minutes to my start time. Molly left about 30 minutes ago. Sporting the new 53x11 Coffee kit. Thanks Evan for the sponsorship. Our little hotel is very active this morning. All the serious Century riders are heading out. They want to start at 7am. They use a staggered start here. Don't know why but I had a lot of nervous energy last night. Not the best night's sleep. The time I spend riding my bike often serves a similar purpose as meditation. It's a parenthesis of time where the focus is the present moment. Whether I'm going up a hill or working on spinning more smoothly, If I'm doing it right, my thoughts are completely on the pedal stroke at hand, or more precisely, foot. Yet, that constant concentration on the now has a cumulative effect. There is a ride that I like to do. It starts at my doorstep, it goes to Escondido, just a couple of blocks from where the Tour of California ended and then back home. It's got some rolling hills and some flats. A good all-round 28 mile ride. When I started doing this ride, I used to worry about making sure I saved enough energy to get back home; about getting over the hills that I would reach much later, about the headwind I would undoubtedly encounter on the return leg. All that worry took away from paying attention and ultimately just added time to my ride. Where in the past I would be concerned about my ultimate average speed and the overall ride, in the last few weeks I've been concentrating on immediate things, things in the moment: cadence and heart rate. All I worry about is that at the present moment I'm producing the highest possible cadence while staying in my Tempo and Sub-threshold workout zones. I don't mind going above those zones during hills or deliberate hard effort sections, but for the most part, I try to keep it tempo. The results? I've been shaving a minute or two from that ride over the last 3 or 4 weeks. I've heard Mari Holden, former National Time Trial Champion, Olympic silver medalist in the time trial, World Champion and all around cycling babe, talk about staying in the moment. For her, every pedal stroke, every turn, every small rise of the rode was an opportunity to put time on her rivals. But to take advantage of that she had to be present for each of those opportunities. In cycling, as in life, there is no better way to get a favorable result than to focus on the moment at hand. For now, it was a good week of training, even though I was in San Jose for the weekend. 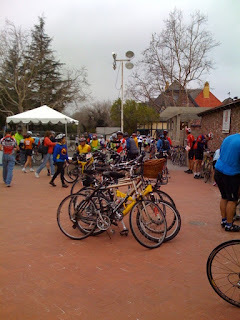 On March 14, I will be doing the Solvang Century, half-century for me. I look forward to reporting back next weekend, hopefully I'll beat my time from last year. Nevertheless I can guarantee that my focus will be heart rate and cadence, because a good ride is built moment by moment.